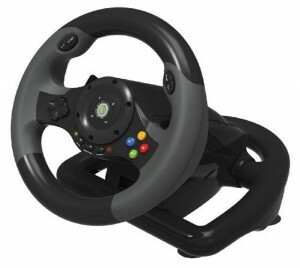 Driving simulation is a big market within the gaming fraternity; there are numerous wheel stands, cockpits, driving wheels and of course games available, but which do you choose if you are a casual driving gamer. Even the most casual gamer doesn't really get off on driving using a controller because it just doesn't feel right. Maybe in the future if cars have XBOX 360© controllers fitted instead of steering wheels, we will feel comfortable. Instead you can't beat having a wheel in your hand as you rip it up around Silverstone in your Aston Martin. The first problem I did have was finding XBOX 360© compatible wheel, not easy. There are plenty of mega expensive ones out there, but who wants one of them if you are a casual driving gamer? I know I wouldn't fork out that kind of green for a wheel. Look no further my friends because I have scoured the internet and come up with 3 driving wheels that, in my opinion, are a step above the rest and pleasantly affordable. First off we have the 458 FERRARI ITALIA RACING WHEEL from THRUSTMASTER, which for the measly sum of £59.99 is not bad, I was impressed by its sturdy construction and sensitivity, although it did take a few goes on FORZA 4 to get the hang of it. The paddle gear change is a nice touch and apparently is a replica of a real FERRARI 458 steering wheel. Mind you if the real thing is as clunky as this, I don't think I will be splashing out on a FERRARI any time soon. 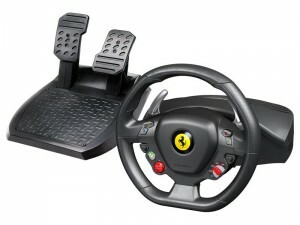 This is billed as the first wheel with official licenses from FERRARI and MICROSOFT XBOX 360© so it should be good. To be honest it isn't half bad for the price. The lack of Force Feedback does go against it though, but if all you want is to be able to drive around then this is the one for you. The 458 is compatible with Xbox 360© and PC (you will have to download drivers for XP). The 458 performed well and is a nice solid wheel. 28 cm in diameter (apparently 7/10ths of the original) with metal paddle gear changers and a rubber texture covered wheel, it certainly did the trick. The solid construction makes for some real rough gameplay as you fight your way through the pack. Now here are some of the bad points, which to be honest aren't many. For one thing the lack of force feedback, does make a big difference to the experience. OK it is a cheap wheel, but it would have been the icing on the cake to have had it. The other problem I found was the length of the cable. It says it is 3 meters in length, but it didn't look like it when I used it, as I had to buy an extension lead for the cable. Otherwise it dangled over the pedals and became annoying. The usual buttons (8 in all) are there, except the D pad is actually the START button which is a bit clunky and has a cheap feel to it, and again it serves a function. The pedals were OK with good resistance and felt responsive in game play, and the clamping system is pretty straight forward and easy to use. 28 cm XXL size (7/10ths of the original) with rubber texture cladding for optimal handling on Xbox 360®. Wheel-mounted sequential gearbox: 2 Ferrari GT-style metal paddle shifters. 8 easy-access action buttons + one 8-direction D-pad in the form of an “Engine Start” button. Xbox Guide button with illuminated ring indicating the player number. Next on my list is the EX2 from HORI, a Japanese company. Surprisingly enough it's not a bad little wheel (I say little as it is smaller than the other two I tested). Another Microsoft licensed product, therefore it should be of a certain standard. TheEX2 is a tough well constructed wheel and should be able to take a fair bit of punishment. The rubber type grips help with those sweaty palms after 5 laps of Silverstone. This wheel is aimed kids more I would say, and as a budget wheel it is much better than all the trashy cheap XBOX© wheels that are out there. A couple of things do let it down though. Mounting for one, it's just a couple of suction cups which tend not to stick, so reattaching is a bit of a pain. Although it does feel more robust than the THRUSTMASTER, this does become a bit of a nuisance after a while ( a mounting bracket would have been nice). I did think the pedals were a little too small but then this is a kid's wheel (I assume). On the plus side it does have vibration. OK so it's not force feedback, but what do you expect for this kind of price, £55.95. Another bonus is it does have a headset connection. Unfortunately it doesn't work with my headset (different adaptor), but it will fit with a standard jack plug and some of the cheaper headsets. Handling was OK actually, very responsive and positive with nice solid paddle shifters and plenty of buttons (which are programmable) and it certainly did the trick, even though again there is no Force Feedback. Cable length is good, and doesn't get in the way. 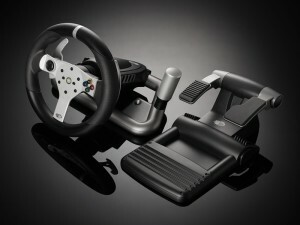 Finally we come to the Cadillac of wheels the MAD CATZ WIRELESS FORCE FEEDBACK RACING WHEEL for XBOX 360©. If there is such a thing as love for a machine, then this is it. From its sleek mainly metal construction to its outstanding performance, every home should have one. OK it's not the cheapest wheel, prices start at £151.00. But this is less than half the price of a wheel that is the same spec, so it's a no brainer really. Plus you do get what you pay for and more with this, excellent build quality and long term durability. I was so impressed with this wheel I wanted to elope with it to Gretna Green, get married and have its babies. [Geez, tell us how you really feel Dayvid! – Ed.] It really makes driving simulation games come to life like nothing else. It's like taking it to the next level without ruining your bank balance. Plus it's at a price that partners/wives will not frown about, roughly the same price as a trip to the hairdressers! Another great thing about it is wireless connection, so no wires trailing across the living room which again will appease the other half. The only criticism I have is the power cable is a bit short when, especially like me, you are using a powered gaming chair (an extension lead sorted the problem). The other problem I had was fitting it to my Wheel Stand Pro. OK you can get the attachments for it, but the table clamp wouldn't fit. Anyway a couple of cable ties and problem solved. Again I tested this wheel with FORZA 4 and boy what an experience! It actually became tiring wrestling with the wheel at speed. On corners you hit the kerb in this baby and the wheel jerks out of your hand like the real thing. Having driven some high performance cars in real life, THE MAD CATZ WIRELESS WHEEL is the closest I have been to the real thing. Granted it's not 100%, but as near as dammit and good enough for me. Now for the tech stuff: compatible with the XBOX 360©, complete with dual vibration and force feedback motors which can be used simultaneously; a tiptronic style shift gear change, located on the right or left; a metal chassis, and it can be connected to a PC for firmware updates. As you have probably guessed by now, I really like this wheel. When you look at equivalent products that are twice the price and more, then I think you'll see that MAD CATZ have hit the nail on the head with this one. There is no denying that this is a very good set up at a just the right price and is the obvious choice if you want to go to the next level in driving simulation, but £300 is out of the question. There is nothing on the market (that I could find) that matches this wheel for build quality and price. Alright folks we all know where this is going… of course I am going to recommend the MAD CATZ WIRELEES WHEEL. Let's face it, why not? It is a great and well-built product, and you do get a high end product for a mid-range price. As for the others, the THRUSTMASTER 458 is the biggest out of the two cheaper wheels and pretty robust, however the lack of vibration/force feedback lets it down. As for the HORI EX2, it's a great little product ideal for a kid, or small adult, plus tougher than the THRUSTMASTER 458. At the end of the day it's all down to budget. If you want that extra bit of vavavoom!, then save up a bit longer and get the MAD CATZ. If you only want a cheap wheel to play the occasional driving game, then either of the other two will do. At the end of the day there isn't much out there for us XBOX© users and these are the better ones at the low end price scale.